The service has reportedly been knocking around university research labs for the last few years – and aims to let couple kiss each other through the internet. It’s a brightly-coloured smartphone holster with an inviting plastic pad attached to the bottom. You lock lips with the pad and it transmits the sensation through to an identical holster and an identical pad that’s nestling your partner’s phone wherever that may be. The creators admit that there’s still a way to go when it comes to accurately creating a long-distance makeout session. For starters, the pad isn’t mouth-shaped (although the actuators are lined like lips) and there’s no simulation for a tongue. But the creators insist that it’s already helping to get people accustomed to machine-based touching. And, moreover, that it’s not being used in an overtly sexual way. 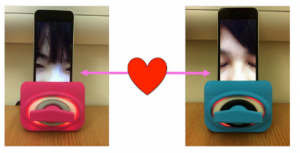 “Parents can also use Kissenger to give their children a kiss on the cheek when they are away at work,” say its creators.Zhang explained that the next stage of the Kissenger is to build scent into the prototype.So you can get the authentic smell of the person you want to kiss.